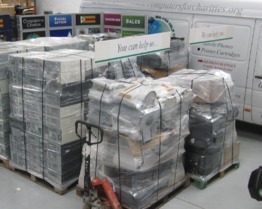 Computers for Charities roots go back to 1992 though 1994 saw the wheels begining to turn. Over this period CfC has handled in excess of 250,000 computer systems, benefitting numerous projects and organisations across the UK and 106 countries worldwide. 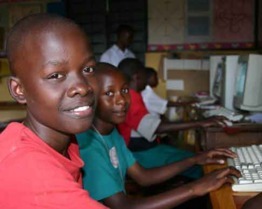 CfC as developers not only refurbishes donated equipment to the highest level, but also conceives and operates home grown programmes to aid the disadvantaged, as with African schools on Line an integrated educational program providing computer access and curriculum development to over 100,000 children plus adult learning. I.T Support to UK Charities and Voluntary organisations, is how it all began and remains a core part of our work. 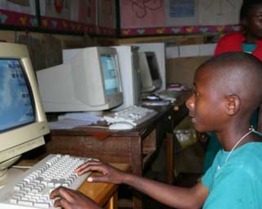 Whilst Computers remain a key part of the charities activities. Our core activity is working with people either directly through the organisations and projects we support or within the charity itself. From workers in Romania, School children in Zimbabwe, Migrants in Calais, Offenders in Prison or the caller today making a general enquiry. Our slogan aptly describes the organisations ethos " Passionate about People" with our endeavours to offer security, acceptance and dignity to those we encounter. Sadly capacity limits what can ideally be offered, however whatever the circumstances we try to give every one a chance. Bob is one such fellow. He was referred to us by one of the agencies and now attends of his own accord for around 12 months... His schooling was undertaken at a school for children with special needs, there he was bullied to the extent of having bricks thrown at him. As with all new volunteers, we ask that they write a short life history to help us get to know them better. Bob has mental health issues, which have not made it easy to get a job. Still living at home, but then so is his older brother with parents now well into their 70's. Bob writes about his volunteering at CfC. Saying " I like the fact I can get up in the morning and go to work like everyone else in this world. I am allowed to function as an individual and have found a new confidence and the ability to work with others. I used to be shy and was bullied, I wouldn't say boo to anyone" Nowdays its the opposite and a real job to stop him jabbering. Sadly for people like Bob, the outside world is not so caring and a lot more demanding. Limited funding precludes us from providing paid employment. In addtion Mentors are needed to enable support and coaching opportunities to help these deserving folk reach potential. Computers for Charities has ongoing experience of providing work experience opportunities for all ages 16+. Julian and Jeremy featured in the photo are from Northern France undertaking 4 and 8 week experiences through the EU Erasmus program.